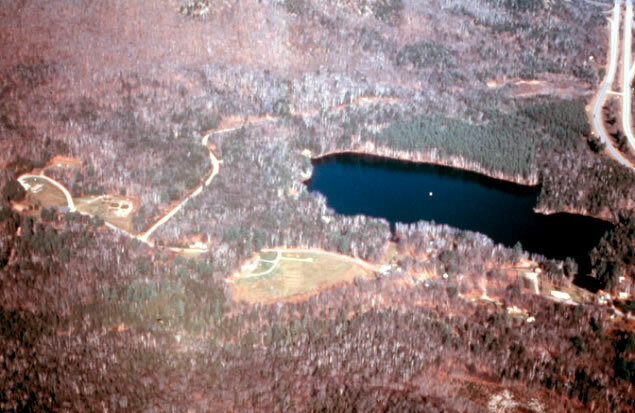 Flow and Transport in Fractured Rock, Mirror Lake, N.H.
An areal view of Mirror Lake, which is located in the Hubbard Brook Experimental Forest, N.H.
Outcrop of a fractured rock aquifer where fracture characteristics were measured. Drilling a bedrock well in the Mirror Lake, N.H., watershed. 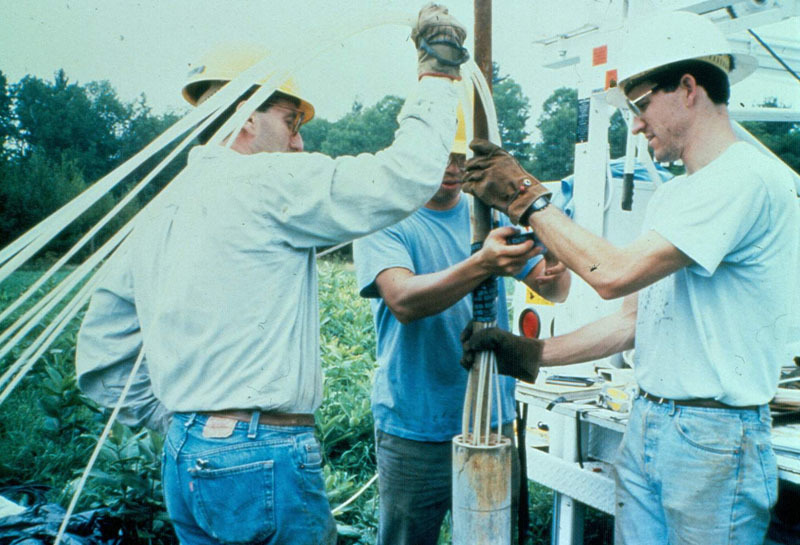 USGS scientists used bedrock wells to characterize bedrock geology and fractures, and to conduct hydraulic and tracer tests to identify properties of fractures that control fluid movement and chemical migration. 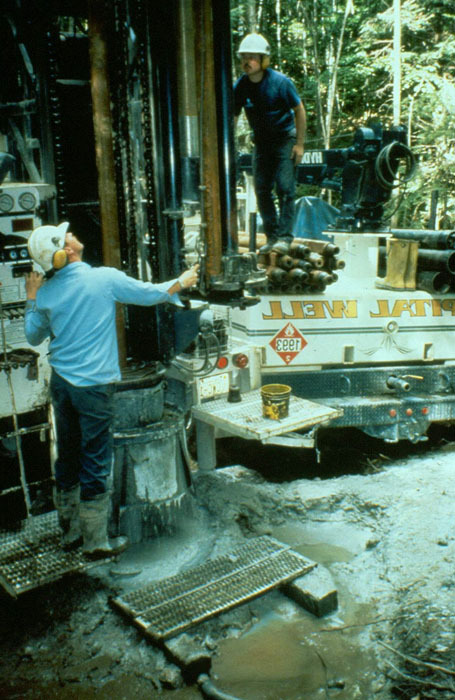 USGS scientists positioning drill stems so equipment can be lowered into a bedrock well to conduct a tracer test in fractured rock. A series of tracer tests were conducted to identify interconnected fractures at the site. 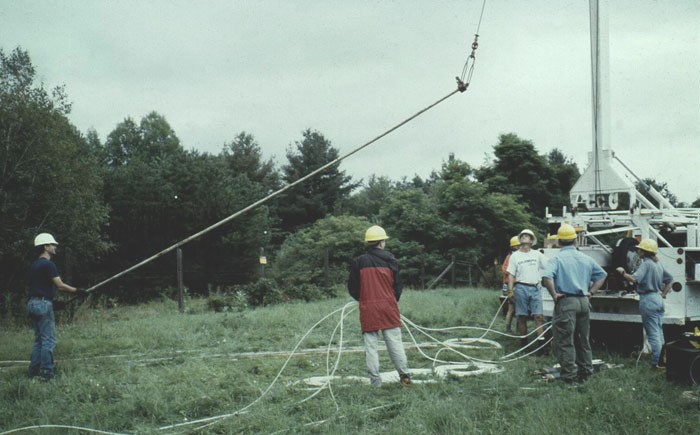 USGS scientists lowering equipment into a bedrock well to conduct a tracer test in fractured rock. Tracer tests were used to gather information on the hydraulic and solute transport properties of fractures and fracture networks. 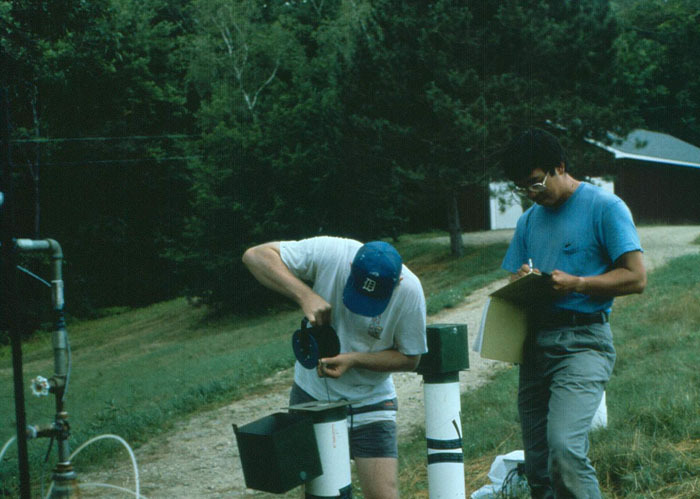 USGS scientists making a manual water-level measurement during a hydraulic test in a fractured-rock aquifer. Manual water-level measurements were used to check pressure transducers that automatically record water levels in wells. 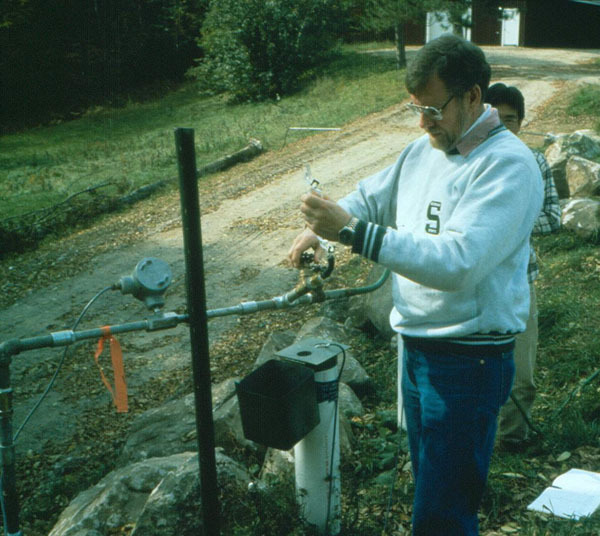 Collecting a water-quality sample from a bedrock well during a tracer test in a fractured-rock aquifer. Controlled tracer tests were conducted to identify processes that control the migration of contaminants in fractures. 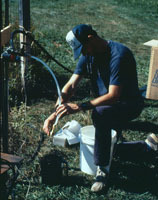 USGS scientist collecting a water sample during a tracer test in fractured rock. The tracer test was designed to study the diffusion of solutes from fractures into the primary porosity of the rock. 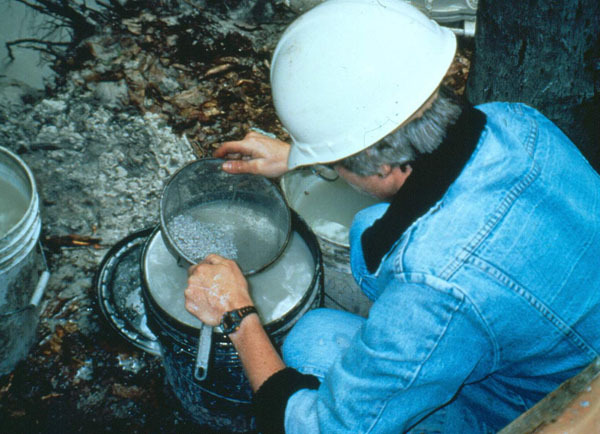 USGS scientist examining rock chips from drilling a bedrock well. The rock chips were used to identify the subsurface lithology of the fractured-rock aquifer that the borehole passed through. 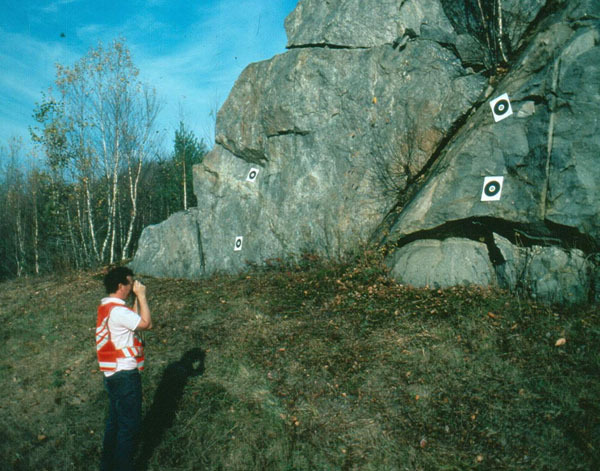 Outcrop studies were conducted to assess the orientation, length, aperture, and other parameters of fractures in the Mirror Lake watershed. This information was used to better understand the connectivity of fractures and their capacity to transmit water. 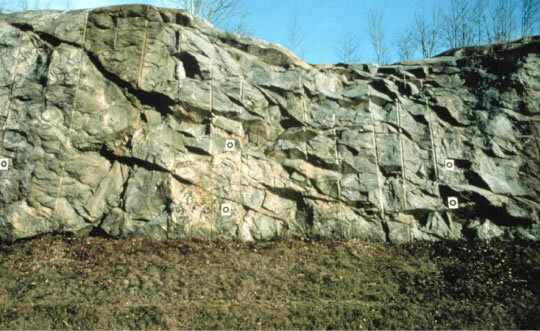 USGS scientists studied outcrops in the Mirror Lake, N.H., watershed, such as this one from a road cut on Interstate 93, to characterize the fracture network in the study area. 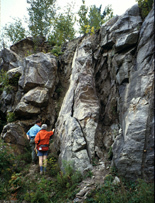 The pavement method was used, which involves mapping fracture traces on a detailed geologic map. 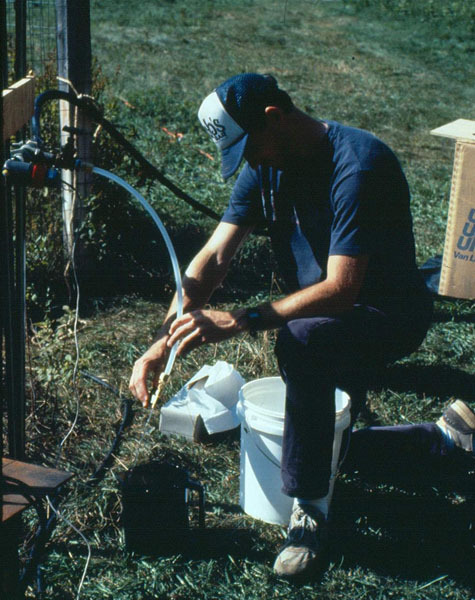 USGS scientist collecting a groundwater sample for a study of the water chemistry of a fractured-rock aquifer.